These top my list of "must have" baking tools. All you have to do is soak them in cold water, squeeze out the excess, and then pin them around the outside of the pans before baking your cake layers. They cool the sides of the pan, so the edges cook more slowly and the entire cake bakes evenly, producing lovely level cake layers. 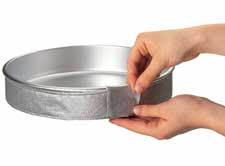 Pictured below are two 8" round white cake layers, both made from the same box of cake mix and baked in Wilton aluminum cake pans. One pan had a Bake-Even Cake Strip on it, the other did not. It's pretty obvious which is which, isn't it? Layer baked in pan without a Bake-Even Cake Strip: notice the over-browning of the cake sides, crispy edges, and cracked mound on top. The layer baked with a Bake-Even Cake Strip on the pan has level top and evenly baked sides.